VersatileDogs.com • View topic - Overtraining a dog in its first year. Is it possible to overtrain your dog in its first year and does too much bird training hinder a dogs development. 2014 was one of the worst years for dog birds here in Southern Idaho. I hunted a lot and saw very few birds. Despite the low bird numbers, there was no training in bird launchers, NAHVDA days etc. I just wasnt involved yet in NAHVDA and the drought had really taken its toll on wild birds. Yet I hunted and hunted a lot. My dog was taken on walks nearly every day in the offseason. She learned that birds were not easy. During that time she gained confidence and ran hard. I reached out yo a few people who said, hunt them often, dont worry about the chase, let them screw up. Dont FF after the first season. Now fast forward 4 years. I have a dog with a great motor. She tracks, adjusts to species and terrain. I fully expect to have a broke dog by hunting season. I have often wondered if it was just genetics, the fact I hunted her and let her roam, or the fact we struggled to find birds that have made her the dog she is. Or a little bit of all of it? Thoughts? While I am still an advocate of intrductory training, do we do too much. Should we just let dogs be dogs a little? As I have read so many posts on training and been involved in helping and training myself. It seems like we can train too much too early. 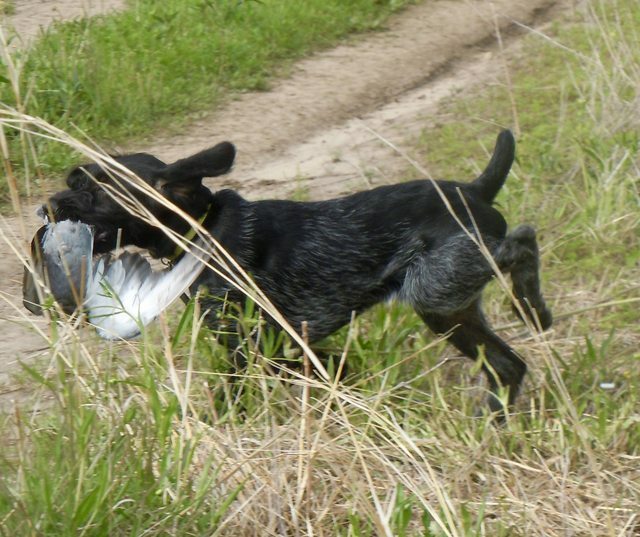 I often see so many people just doing bird launchers, are we training a dog that hunts are easy and short? Some race to get a utility prize on their dog. Has the dog learned to be independent first. Last edited by Meridiandave on Wed Jun 20, 2018 5:58 pm, edited 1 time in total. Re: Overtraining a dog your first year. I have never Steadied or FF a pup until after its first hunting season. I develop their natural retrieve, introduce birds, guns, water, boats, decoys and then hunt them as much as possible. They get daily outings in game country starting at 9 weeks in low cover and advancing to more challenging cover as they develop. All my puppies have hunted Doves, Waterfowl, Quail and Pheasants (wild ones) in their first seasons. I do not shoot the birds they do not point, but do allow them to chase the birds I flush off their points. I train come, heel, sit, stay, down, whoa (not used around birds but trained so steadiness work can begin in the Spring after the first hunting season) and kennel starting young and used clicker/marker word and treats. I also do alot of development on the Hunt Dead command starting young. And I introduce the Ecollar and train the Come command to the tone on the collar so we can hunt in silence. I have had excellent success working my puppies on pigeons in launchers set in natural cover. We in effect hunt pigeons. When the pup creeps in, I launch the pigeon and let it fly away in silence, letting the pup give chase, but I am walking towards the next bird and the pups learn to go with me. When the pup points and lets me get ahead to flush, I launch and shoot the pigeon. The approach has zero pressure and teaches the pup the rewards of pointing and letting me flush which puts us ahead when we start hunting wild birds in our first season. Pups having been worked in this manner are much more apt to point and hold a point when they get into wild birds in their first hunting season. The key is to present the birds in a natural manner and in silence. No Whoa, No holding the pup back on a check cord, No ecollar being used. I put a Prize 2 on a 17 month old GWP handled in this manner and a Prize 1 on my current dog at 18 months old, which are my last two succession of dogs. All the low pressure early development and then hunting I put on them going into and during their first seasons had them ready to absorb the training so we did. Both were/are bold bird finding and retrieving dogs with no harmful side effects from being brought along rapidly in this manner, but the key was delaying those elements of training where more pressure is used until after their first hunting seasons. Dave, I think that sometimes it might depend on the dog a bit but in general yeah, I agree. I mean with my first Wirehair I followed roughly the same plan that first year as far as not putting many controls on him, at least in the field but I did have to go to the collar a bit more than I wanted on recall. Not for lack of training it, he's just head strong and would self hunt too much (I think that was exacerbated by his catching too many training birds before I got smart and switched to homers only.) Anyway, my second Wirehair and just turned 1yr old over the weekend and I've given her even less controls but she's overall much more naturally cooperative in nature than he is (heck, I'm probably even behind where her recall should fully be.) Last fall, even as a young pup I got her out on as much wild birds as I could as well as the state's released pheasants. I didn't say anything, I just let her do her thing and learn thru her own experiences, with me their in a quiet supportive role. Her first bird contacts were actually grouse, she was about 12 wks old. I got her out on woodcock this spring too. I deginitely don't wait to get my dogs rolling our in the woods and field. Tons of exposure. So far in training she's only been exposed to homers in launchers and has not had s bird planted for her, not risking her catching one. She's had only one bird ever shot for her, a duck on her first exposure to duck search about a month ago. She runs her NA on July 1st. After that she will be force fetched. I hope to be done with that around the end of August. Then I'll probably put her back in the field and shoot some birds for her. I'll demand she holds her point at least to the flush or no birds will be shot. Then we'll just have fun during hunting season. I think between her personality and breeding along with giving her that first year with very minimum controls but lots of exposure she is well on her way to being the versatile hunting dog I hope she will be. The controls will be completed by the end of next summer and she will be UT tested in September or October. I expect how I went about year one will pay dividends for year twos plan. Other than basic obedience (this includes fetch) I don’t do much more. Once the pup gets fired up for birds, I try to get chasing and creeping under control. This is an offshoot of teaching whoa and/or stay with the e-collar. I’m very gentle with the collar. When I was back in Wisconsin and hanging out with Griffman, I took on a whole new appreciation for early training. They hunt different birds in different conditions and the early training they do is necessary to have a productive first season with a pup. Out west, we have it a whole lot easier and doing as little as possible is usually enough. 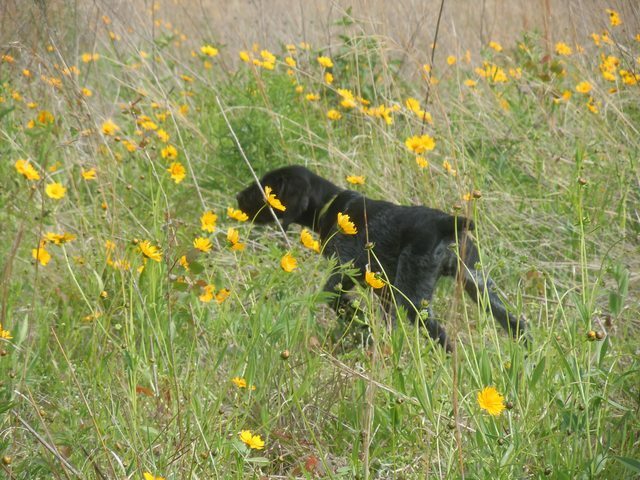 Training consists of nothing more than fine tuning a pups natural desire to hunt. One shoe does not fit all. Once you have a reliable recall and retrieve why are you still at home? Hunting makes hunting dogs. Training makes hunting dog starter kits. If you train correctly and can read a dog, it is absolutely impossible to train too much in ANY year of a dog's life. I am a rookie. This is my first hunting dog, but I work hard at making training fun and somewhat unpredictable. Most of the other guys I know don't train enough and it really showed in their test scores. This year will be his first real hunting season. Let me rephrase the question. Is it possible to overuse launchers in your first year? When we use a lot of launchers rather than letting dogs run on wild birds hunts last minutes rather than hours. Do dogs develop a lot of drive when things are that easy? Surely someone somewhere overuses or misuses launchers and lags in exposing their puppies to wild game. That would not make the tool a poor choice for those that know how to use them however. My puppies catch on really quickly, love it and will rip up a sizable field of cover to find, point and retrieve a pigeon in a launcher starting at around 3 months of age. We continue working them once or twice a week until the hunting seasons open and do not use them again until we are working on Steady to WSF. Here is my current pup at 3 months of age after hunting for locating and pointing and holding a point on a pigeon set in a launcher. Same pup retrieving the pigeon after it was launched and shot. He hunted, pointed and retrieved wild bobwhites, pheasants and sharptail grouse in numerous states as well as doves and waterfowl in his first season. The early training with the pigeons in launchers set us up for early success and I shot wild birds over his points on each of his first hunts on each bird species and each of the 6 states we hunted. Launchers are an excellent training tool. Like any tool/training method they can mis-used or over-used. As to how often others do that I do not claim to know. I think much of this question you pose centers more around the elephant in the room, which is do people have any wild birds to expose their puppies to or are captive/released birds their only option. In my opinion that is the potential issue and challenge, not launchers. And to that subject, yes I think that released captive birds smell to high heaven compared to a wild bird, are not wary, fly poorly and are hunted most often in small fields and less than natural cover. A young dog worked only under those conditions and birds is very likely to develop bad habits around birds and lack the learnings necessary to excel on wild birds. But I would rather see folks raise, train and hunt their puppies as best they can under their individual circumstances than have them drop out of our sport. Personally, I want my pups to learn to be dogs. I seldom handle them and I may not even be home a lot of the time. I let them figure out what dogs do because they seem to adapt to any future training better. When I start working with them, I want them to be interested in what I am doing...not everything else around because they haven't had adequate exposure to the world. I expose them to really good things that makes them what what I want them to be as adults. Stuff like in this video. Screw they early training....they have a lifetime of that. So that would be exposure to game. In the case of your video dead game e.g. a squirrel. I do a lot of that but I call it training. Add a pup with a good tracking instinct and search is shot as pup tracks and steamrolls into the launchers. hicntry wrote: Personally, I want my pups to learn to be dogs. I seldom handle them and I may not even be home a lot of the time. I let them figure out what dogs do because they seem to adapt to any future training better. When I start working with them, I want them to be interested in what I am doing...not everything else around because they haven't had adequate exposure to the world. I expose them to really good things that makes them what what I want them to be as adults. Stuff like in this video. Screw they early training....they have a lifetime of that. If that can, even loosely, be called training....then maybe I will have to quit saying I am not a trainer. LOL Those free fed pups don't even need any encouragement to devour that squirrel. I suppose putting a bowl of food down would also be training. I couldn't tell what they were doing in that video. Care to explain?